Seasons each have a different feel, a different rhythm. Temperature, weather, sunlight, and traditions—they all vary by season. For me, summer usually includes a beach vacation. And winter brings the smell of hot apple cider on the stove, days in the mountains hoping for the next good snowstorm—and New Year’s resolutions. Somehow January is the time to pause and reflect on the accomplishments of the past year, to take stock in what worked, and what didn’t. And of course there are the TOP TEN LISTS. Spoiler alert, yes, this is a Top 10 list. If you’re a regular on the Citus Data blog, you know our Citus database engineers love PostgreSQL. And one of the open source responsibilities we take seriously is the importance of sharing learnings, how-to’s, and expertise. One way we share learnings is by giving lots of conference talks (seems like I have to update our Events page every week with new events.) And another way we share our learnings is with our blog. So just in case you missed any of our best posts from last year, here is the TOP TEN list of the most popular Citus Data blogs published in 2018. Enjoy. BY SAMAY SHARMA | Postgres stores a lot of statistics about your data in order to effectively retrieve results when you query your database. In this post, Samay dives deep into some of the statistics PostgreSQL stores and how you can leverage CREATE STATISTICS to improve query performance when different columns are related. Related with my post: https://abdulyadi.wordpress.com/2015/11/14/extension-for-qr-code-bitmap/. I have repackage the module and available on github: https://github.com/AbdulYadi/pgqr. In-memory monochrome bitmap construction (1 bit per pixel). Wrap the whole package as PostgreSQL extension. This project has been compiled successfully in Linux against PostgreSQL version 11.
t text: text to be encoded. correction_level integer: 0 to 3.
model_number integer: 0 to 2.
scale integer: pixels for each dot. The output is a monochrome bitmap ready for display. In the Bay Area? This Tuesday, 2019-01-15, SFPUG features David Fetter's talk on ASSERTIONs. RSVPs close Monday at noon, so don't hesitate! Thanks to Heap for hosting at their FiDi office. What is the role of PgBouncer in a Postgres High Availability stack? What even is PgBouncer at the end of the day? Is it a glorified traffic cop, or an integral component critical to the long-term survival of a Postgres deployment? When we talk about Postgres High Availability, a lot of terms might spring to mind. Replicas, streaming, disaster recovery, fail-over, automation; it’s a ceaseless litany of architectural concepts and methodologies. The real question is: how do we get from Here to There? It’s no secret that the application stack must communicate with the database. Regardless of how many layers of decoupling, queues, and atomicity of our implementation, data must eventually be stored for reference. But where is that endpoint? Presuming that write target is Postgres, what ensures the data reaches that desired terminus? In this case, it doesn’t matter what type of Standby we’re using. It could be a physical streaming replica, some kind of logical copy, or a fully configured BDR node. Likewise, the Failover Mechanism is equally irrelevant. Whether we rely on repmgr, Patroni, Stolon, Pacemaker, or a haphazard collection of ad-hoc scripts, the important part is that we separate the application from the database through some kind of proxy. Patroni relies on HAProxy and Stolon has its own proxy implementation, but what about the others? Traditionally PgBouncer fills this role. Without this important component, applications must connect directly to either the Primary or post-promotion Standby. If we’re being brutally honest, the application layer can’t be trusted with that kind of responsibility. pgbouncer is the most widely used connection pooler for PostgreSQL. This blog will provide a simple cookbook how to configure user authentication with pgbouncer. I wrote this cookbook using Fedora Linux and installed pgbouncer using the PGDG Linux RPM packages available from the download site. But it should work pretty similarly anywhere. What is a connection pooler? Setting max_connections to a high value can impact performace and can even bring your database to its knees if all these connections become active at the same time. Also, if database connections are short-lived, a substantial amount of your database resources can be wasted just opening database connections. To mitigate these two problems, we need a connection pooler. A connection pooler is a proxy between the client and the database: clients connect to the connection pooler, which handles the SQL requests via a relatively stable set of persistent database connections (the “connection pool”). Since clients connect to pgbouncer, it will have to be able to authenticate them, so we have to configure it accordingly. This method is useful if the number of database users is small and passwords don’t change frequently. For that, we create a configuration file userlist.txt in the pgbouncer configuration directory (on my system /etc/pgbouncer). The file contains the database users and their passwords, so that pgbouncer can authenticate the client without resorting to the database server. You can write the file by hand using the information from the pg_shadow catalog table, or you can create it automatically. If it is not on your PATH, you’ll have to use the absolute path (something like /usr/pgsql-11/bin/psql or "C:\Program Files\PostgreSQL\11\bin\psql"). Nordic PGDay 2019 is happy to announce our schedule has now been published. Our registration has also been opened. Seats are limited so we recommend that you register early if you are interested! Early Bird discount is available until February 17th or for the first 40 tickets. pg_ctl promote, which waits for the standby to finish the promotion before exiting by default. Define promote_trigger_file in postgresql.conf and create the file which would be detected by the startup process and translated so as recovery finishes (or trigger_file in recovery.conf up to v11, recovery parameters being merged to postgresql.conf in v12 and newer versions). The commit mentioned above offers a third way to trigger a promotion with a SQL-callable function, which presents a huge advantage compared to the two other methods: there is no need to connect to the standby physical host to trigger the promotion as everything can be done with a backend session. Note however that this needs a standby server able to accept read-only operations and connections. The Jan meeting will be held at 18:00 EST on Tues, the 22nd. Once again, we will be holding the meeting in the community space at CoverMyMeds. Please RSVP on MeetUp so we have an idea on the amount of food needed. CoverMyMeds’ very own CJ will be presenting this month. He’s going to tell us all about how CoverMyMeds uses VividCortex to assist with monitoring PostgreSQL and maintaining the high performance of the database. You can safely ignore any sign saying to not park in the garage as long as it’s after 17:30 when you arrive. Park in any space that is not marked ‘24 hour reserved’. The kitchen is to your right (grab yourself a drink) and the meeting will be held to your left. Walk down the room towards the stage. 2019-01-03 07:51:38 GMT WARNING: oldest xmin is far in the past 2019-01-03 07:51:38 GMT HINT: Close open transactions soon to avoid wraparound problems. 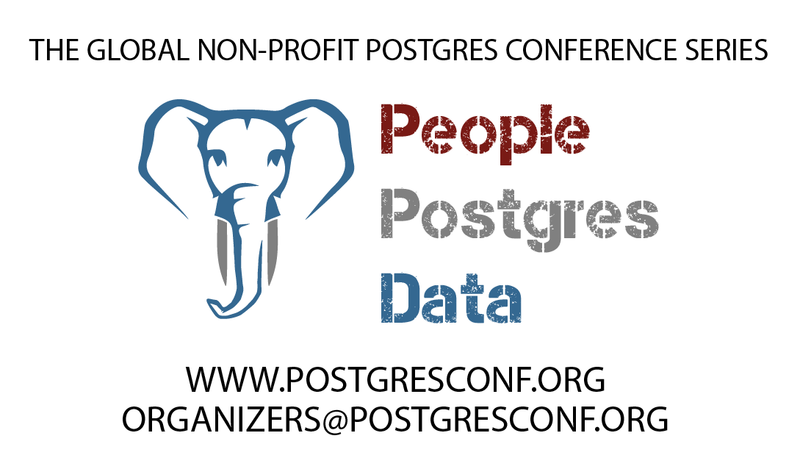 For any questions or comments regarding Postgres-BDR, please send an email to info@2ndQuadrant.com. A few days ago was the release of a new version of ClusterControl, the 1.7.1, where we can see several new features, one of the main ones being the support for PostgreSQL 11. To install PostgreSQL 11 manually, we must first add the repositories or download the necessary packages for the installation, install them and configure them correctly, depending on our infrastructure. All these steps take time, so let’s see how we could avoid this. In this blog, we will see how to deploy this new PostgreSQL version with a few clicks using ClusterControl and how to manage it. As pre-requisite, please install the 1.7.1 version of ClusterControl on a dedicated host or VM. To perform a new installation from ClusterControl, simply select the option “Deploy” and follow the instructions that appear. Note that if you already have a PostgreSQL 11 instance running, then you need to select the ‘Import Existing Server/Database’ instead. When selecting PostgreSQL, we must specify User, Key or Password and port to connect by SSH to our PostgreSQL hosts. We also need the name for our new cluster and if we want ClusterControl to install the corresponding software and configurations for us. After setting up the SSH access information, we must define the database user, version and datadir (optional). We can also specify which repository to use. In this case, we want to deploy PostgreSQL 11, so just select it and continue. Then, you can follow the other steps on my previous post and everything should compile and function properly.